Today I have a CAS Christmas card - the first make for my 2018 stash. I treated myself to this MB Pine Trio Outline die and die-cut it with some glitter gold and dark green cardstocks along with a white card base. 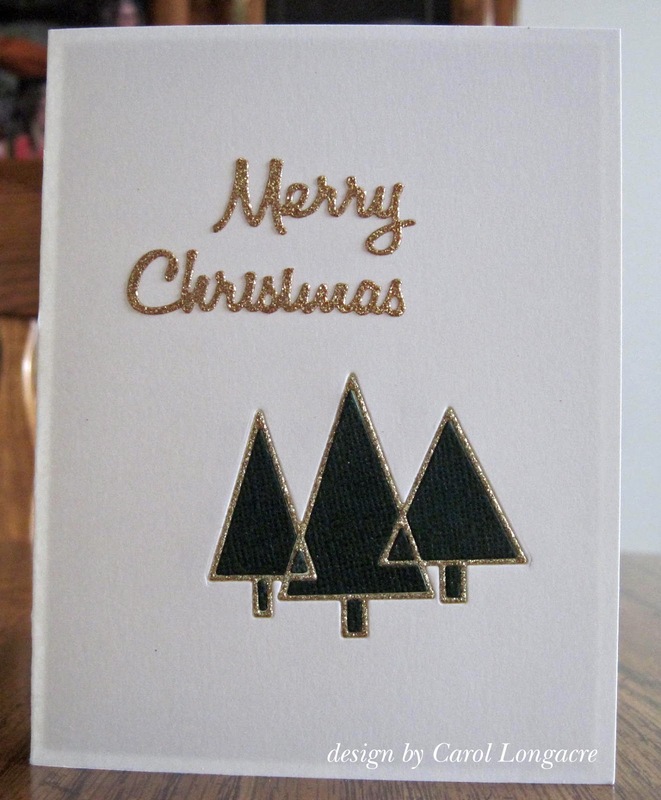 I placed the negatives back into the card base, adding interest with the green trees outlined with gold. The sentiment is a glittered gold sticker and I stopped at CAS instead of adding more layers which I always seem to do. Thanks for checking in today, and I do hope you're safe and warm where you are! We are in SE PA and the winds are bitter cold but we only got a dusting of snow, unlike those who live along the Eastern coastline and up into New England! Brrrrrr!! So gorgeous and a simplicity which gives it an elegant look with the gold and green. I love it. Very pretty CAS card with the sparkley gold! I love that look with he black put back in the trees. Great start for 2018! A super Christmas card Carol, such a fabulous CAS design. Look at those happy little trees! Very cute die, and I love the gold sparkle you cut it out of! Good luck with your challenges. It seems that the weather is very crazy... Here the sun today has been hot...it seems already spring! So beautiful,love the CA's style and the shine. Fab. Love those tiny little trees ... so very glad you joined our first prompt of 2018 at Jingle Belles. This is a wonderful CAS Christmas card. Love the dark green inside that worderful chine gold. Thanks so much for joing us at Happy Little Stampers January Christmas Challenge! Such a pretty card, Carol! Love that tree die and how you filled it in. Love all the white space and the pops of sparkle! Fantastic Christmas card and a real beauty to start out the year! TFS and stay warm! Great design and I love the gold outlines. I am loving your first Christmas card of 2018. The gold and green are just beautiful on the white card stock. I like that you left it a CAS. Sometimes they are the best and this is one of those times. Very nice Christmas card! Sure hope you are keeping warm! Brr..It's really cold outside...I'm ready for spring already!